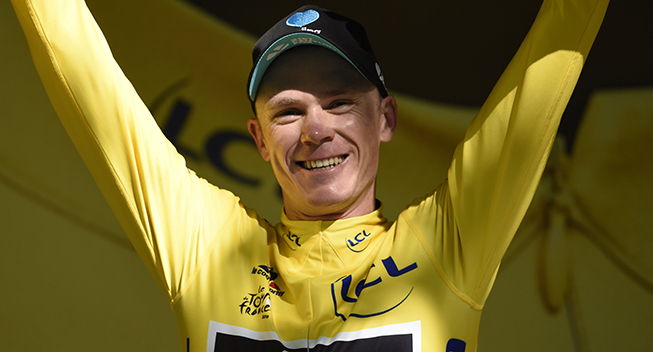 Chris Froome (Sky) confirmed his status as the strongest rider in the Tour de France by claiming a dominant victory in the uphill time trial on stage 18 of the race. Covering the course in 30.43, he came back from a slow start to beat Tom Dumoulin (Giant-Alpecin) by 21 seconds and increase his overall lead to 3.52 over Bauke Mollema (Trek). Fabio Aru (Astana), Richie Porte (BMC) and Romain Bardet (Ag2r) completed the top 5 and moved closer to the podium while both Mollema and Adam Yates (Orica-BikeExchange) lost time. In the last few days, some critics have claimed that Chris Froome only leads the Tour de France due to his fabulous team. The accusation has never been fair as the Brit has matched everybody on the climbs, attacked on the descents and in the crosswinds and gained most of his advantage in the first time trial but today he really underlined his status as the best rider in the race by taking a dominant win in the uphill time trial from Sallanches to Megeve. Going into the stage, many expected a big battle between Froome and Tom Dumoulin (Giant-Alpecin) who had beaten the race leader by more than a minute in the first time trial. However, the 17km in the Alps were almost all uphill and better suited to Froome so it was expected to be a much closer affair. That turned out to be the case and in the end it seems like it was the pacing that made the difference. While Froome had a slow start and only posted the fifth best time at the first time check, 14 seconds slower than the Ducthman, Dumoulin rode very fast in the first half. However, he paid for the effort in the end where he only managed to gain four seconds on Thomas De Gendt (Lotto Soudal) in the last four kilometres before crossing the line to beat the Belgian by 41 seconds. Froome had a different approach and after the slow start, he moved up from time check to time check. Ay the second check, he was third, 10 seconds behind Dumoulin and at the final check he had taken the lead by 13 seconds. He managed to go 8 seconds faster than Dumoulin in the final 3.5km, delivering a perfectly gauged effort to take the win. Richie Porte (BMC) was expected to be the best of the rest and the Australian seemed to be on track when he posted the best time at the first check. However, just like it happened in the first TT, he lost ground in the second part and ultimately had to settle for fourth with a time loss of 33 seconds. The other big winner was Fabio Aru (Astana) who exceeded all expectations by beating Porte by less than a second to take third. That result allowed the Italian to jump from 8th to 7th in the overall standings, overtaking Alejandro Valverde (Movistar) who had a disappointing day with a 12th place. Another big winner was Romain Bardet (Ag2r) who posted the fifth best time, 9 seconds slower than Porte and Aru, and so moved closer to the podium. He is now just 41 seconds behind Adam Yates who had a difficult day as he had to settle for 16th, losing 1.23 to Froome. Things were even worse for Mauke Mollema who was 2 seconds further adrift in 17th but he retained second place, 3.52 behind Froome. Nairo Quintana looked like he was on a very bad day as he was far back at the first check but like Froome he gauged his effort well, ultimately finishing the stage in 10th and moving closer to the podium. He is now just 21 seconds behind Yates and so still has a chance to move into the top 3 during the final two days in the Alps. A lot can still change as there’s a very tough stage coming up tomorrow. The 146km between Albertville and Saint-Gervais Mont Blanc are tough as it is uphill right from the start. Then there is a category 1, a category 2 and a category HC climb on the menu before the riders get to the final climb which averages 8% over 9.8km for the final summit finish of this year’s race. After yesterday’s first big battle in the Alps, there was no chance to recover in stage 18 which was an 18km uphill time trial from Sallanches to Megeve. The first four kilometres were flat before the riders hit the very steep 2.5km climb of Cote de Domancy. From there, it was uphill at around 4-5% for most of the time until the riders hit the final 2km non-technical descent to the finish. It was a sunny day when Sam Bennett (Bora-Argon 18) rolled down the ramp as the first rider and we would later stop the clock in 36.47 to take an early lead. He was beaten by 10 seconds by Lars Bak (Lotto Soudal) who was the second rider to start but it was Leigh Howard (IAM), the third rider, who got a chance to sit in the hot seat for a little longer wth 35.20. The first serious time was set by Alexis Gougeard (Ag2r) who stopped the clock in 33.06 and he would spent most of the morning in the hot seat. Marcel Sieberg (Lotto Soudal) briefly slotted into third before Vegard Breen (Fortuneo-Vital Concept) posted the second best time of 34.33. Marcel Kittel (Etixx-QuickStep) did surprisingly well to take third with 35.14 but it was Maciej Bodnar (Tinkoff) who was expected to be the first threat to Gougeard. However, the Pole had to settle for second, 1.00 behind the strong Frenchman. Oscar Gatto (Tinkoff) moved into the top 5 before Albert Timmer (Giant-Alpecin) moved into third with 34.21. Cesare Benedetti (Bora-Argon 18) became the fifth rider to go faster than 35 minutes with 34.43. Stephen Cummings (Dimension Data) was expected to be a threat but he rode poorly with 35.16. Instead, Christopher Juul Jensen (Orica-BikeExchange) became the next challenger for Gougeard as he slotted into second with a time loss off of 58 seconds. Juul hadn’t caught his breath before Ramunas Navarduaskas (Cannondale) pushed him into third but he Lithuanian was still a massive 40 seconds behind Gougeard. Michael Albasini (Orica-BikeExhcange) then pushed Juul off the podium, going fractions of a second faster than his teammate. Imanol Erviti (Movistar) made it into sixth with 34.18 but it was Nicolas Edet (Cofidis) that people were waiting for. The Frenchman had been fastest at every time check and at the finish, his time of 32.37 was 29 seconds faster than Gougeard’s. Bryan Coquard (Direct Energie) did really well to slot into seventh with 34.11 while world champion Vasil Kiryienka (Sky) saved energy and was far off the pace. Reto Hollenstein (IAM) narrowly missed out on the podium with a fourth place in 33.58 before Pierre-Luc Perichon (Fortuneo-Vital Concept) did what he had failed to do, slotting into third with 33.46. Edvald Boasson Hagen (Dimension Data) did well to take fifth with 33.47 while former world champion Tony Martin (Etixx-QuickStep) suffered on this course, stopping the clock in 34.15. Instead, it was Michael Valgren who became the first real threat for Edet as the Dane took second place with 33.05. Anthony Delaplace (Fortuneo Vital Concept) did a good time trial to slot into fourth with 33.37 but he was beaten immediately as Daniel Teklehaimanot (Dimension Data) who pushed him down one spot by going 16 seconds faster. However, it was Jan Barta (Bora-Argon 18) who became the first threat for Edet as the Czech rode strongly to second place with a time of 32.58. Arnold Jeannesson (Cofidis) bounced back from a bad start to the race by slotting into fifth with 33.07 but it was Tony Gallopin (Lotto Soudal) that many were waiting for. The Frenchman had been fastest at the first check but at the finish he had to settle for third with 33.01. Nelson Oliveira (Movistar) was keen on repeating his third place from the first time trial and after a slow start, he finished strongly. The Portuguese champion moved into the lead with a time of 32.29 but he never got a chance to sit in the hot seat. Less than two minutes later, Romain Sicard (Direct Energie) powered across the line in a time that was two seconds faster than the Movistar rider. Sicard didn’t get a chance to enjoy his lead either as it was already known that Jerome Coppel (IAM) was faster at every time check. The Worlds bronze medallist maintained the speed and became the first rider to go below 32 minutes with 31.58, beating Sicard by 29 seconds to take the lead. Ion Izagirre (Movistar) was one of the outsiders for the stage and after passing the final two checks with the best time, the Basque sprinted across the line in 31.46 to beat Coppel by 12 seconds. He passed Alexey Lutsenko (Astana) relatively early and the Kazakh did well to follow the Movistar and post the sixth best time. Julian Alaphilippe (Etixx-QuickStep) didn’t save any energy and powered to the finish in 33.03 to slot into 9th but it was Thomas De Gendt (Lotto Soudal) that got all the attention. The Belgian had posted the best time at every time check and beat Izagirre by less than a second. Sylvain Chavanel (Direct Energie) did a very good time trial on a course that didn’t suit him and posted the fifth best time of 32.27. Moments later Dumoulin hit the finishing straight and after having been the fastest at every time check, he beat De Gendt by 41 seconds with a time of 31.04. Vincenzo Nibali (Astana) certainly didn’t hold anything back and he moved up from time check to time check before crossing the line in fifth with 32.06. He stayed there for around 30 minutes until Stef Clement (IAM) pushed him down one spot with his time of 32.05. The GC battle heated up when Joaquim Rodriguez (Katusha) hit the course and the Spaniard did one of the best time trials of his life. Having passed the first time check in the third best time, he maintained his speed to slot into fourth with a time of 31.48. Roman Kreuziger (Tinkoff) had hoped to move up in the GC and he had a good ride to slot into sixth with 32.03 but he ended up losing time to Louis Meintjes (Lampre-Merida). The South African did a fantastic time trial with a time of 31.51 which saw him move into fifth and ultimately finish the stage in 9th. Daniel Martin (Etixx-QuickStep) had a difficult day and could only manage 10th with 32.11, ending the day with the worst time of the top 10 riders. Instead, it was Aru who got all the attention when the Italian stopped the clock in 31.16 to move into second, just 12 seconds behind Dumoulin. Valverde didn’t have his best day and his time of 32.01 was only good enough for 8th. However, it was Porte who everybody waited for after the Australian had been close to Dumoulin at every time check. Unfortunately, the Australian had started too fast and he had to settle for third in the same time as Aru. Bardet posted consistently good time check so the French public was jubilant went he crossed the line in 31.25 to slot into fourth. Quintana made a remarkable comeback from his slow start to stop the clock in 31.53, slotting into 9th. Yates had started fast, posting the third best time at the first check, but he suffered in the finale, stopping the clock in 32.06 to slot into 15th. Mollema did even worse as he was two seconds slower than the Brit. Those two riders had barely caught their breath before Froome and appeared and the Brit could raise his arm after crossing the line in 30.43, having beaten Dumoulin by 21 seconds.